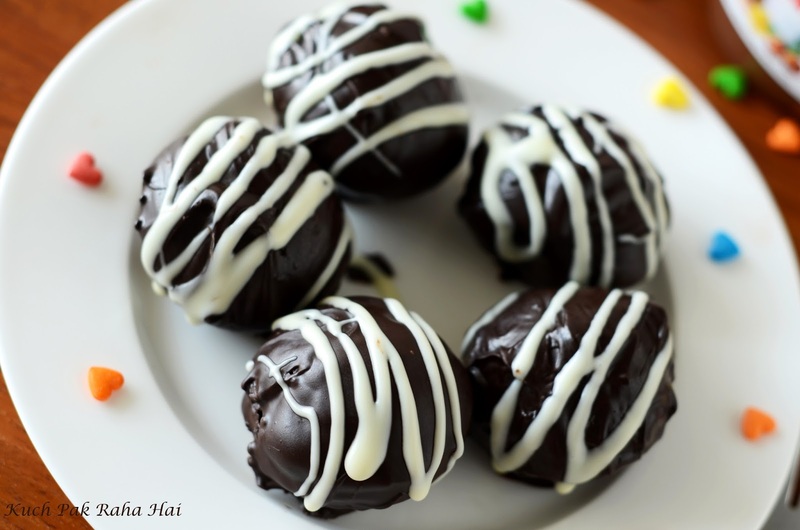 Chocolate Cake pops is a sinfully chocolatey recipe with every layer brining a different texture and sweetness to the palate. The outer layer is creamy dark chocolate with middle layer consisting of soft-spongy chocolate cake and the core consisting of combination of chopped nuts and melt in the mouth Nutella (Who does not love Nutella? :D ). Each layer brings it own taste on the palate and yet goes so well with each other like a symphony. This dessert not only tastes splendid but looks absolutely delightful too. Kids or adults are surely going to get attracted to it merely by the looks of it. Now comes the actual part (of course for which you are reading this post :p), how to make these cake pops. Many people have the perception that if the dish looks too good or fancy, then definitely it must be tough to make. This Chocolate cake pops recipe is going to change your viewpoint as it is so easy to make and that too within no time. A good news for all those having "Bake-o-phobia" (phobia of baking, yes people do have it!! ), this dessert is going to be NO-BAKE recipe. I have met lots of people who loves cakes or cookies but are constantly struggling with their ovens or concepts of baking like temperature settings, preheating or proportions etc. . 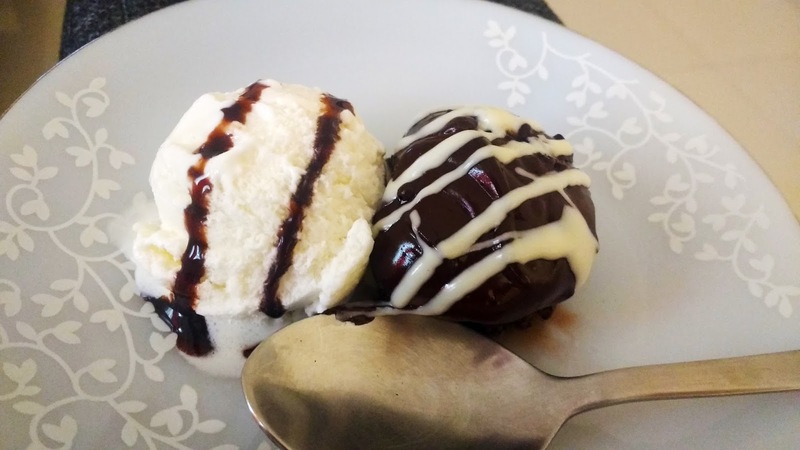 This recipe will definitely save you from all that hassle and you can easily whip up some interesting dessert for yourself and your family. Also, the recipe is EGGLESS and made using Whole Wheat Flour. For making these, first of all we will prepare a mixture of Nutella and chopped nuts. Then we will prepare a batter which would be slightly thicker than normal cake batter. This would be poured in Appe pan (which is also called "Paniyaram" pan). The mixture of nutella and nuts would be dropped in the centre and covered with some more batter. 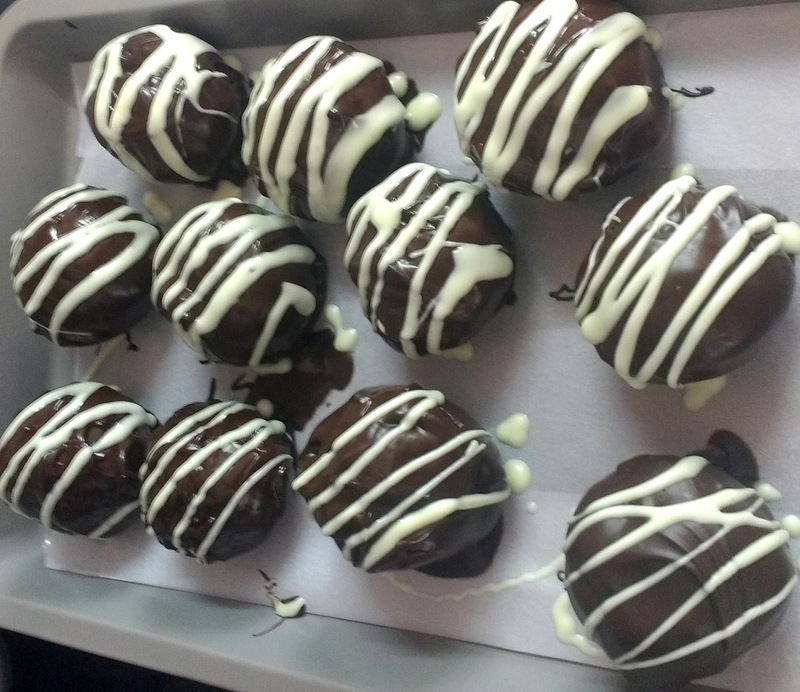 Once these chocolate balls are ready, they would be allowed to cool done. We would be dipping them in melted hot chocolate and then drizzle some melted white chocolate. The garnishing on top is totally optional. 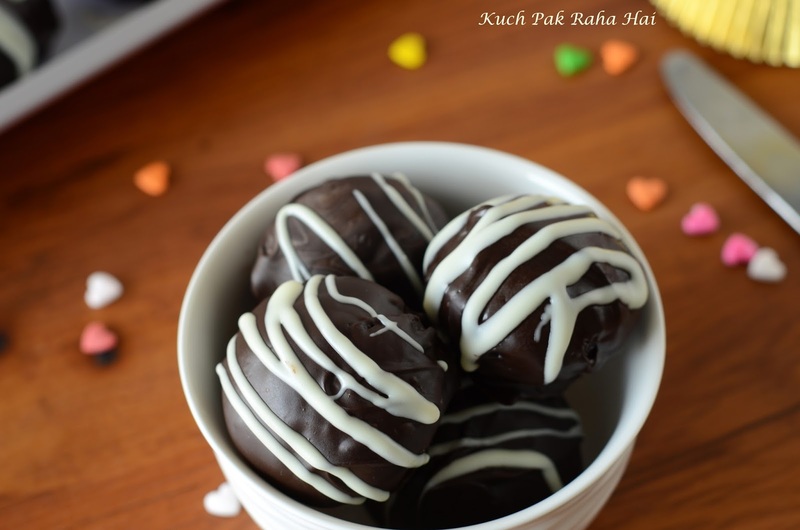 You can consume the chocolate cake pops without this step and still you would love them. The dessert is ideal for serving in kids birthday parties or friends/family get together as you can make it well in advance and store it in fridge. For checking out other party recipes, click here. If you are looking for some no bake desserts recipe, then check out the last section on this Desserts page. Other Appe/Paniyaram stand recipes shared on the blog are: Masala Appe, Stuffed Spinach Corn Appe, Corn Canapés. As I made these Chocolate Cake Pops on the occasion of International women's Day, I dedicate this post to all the lovely women who are working really hard for themselves and looking after their families. My friends and family really liked it, I hope the same for you also. Cheers!! Prepare a mixture of finely chopped nuts and Nutella in a bowl. If the mixture seems to be too thick, microwave it for 10 seconds. Keep it aside. Sieve together whole wheat flour, cocoa, sugar, salt, baking powder and baking soda in a mixing bowl. Mix it well. These are the dry ingredients of our recipe. To the above bowl, add vanilla essence, oil and curd. Fold the batter gently. Start adding milk gradually to the batter as its quantity may vary depending on the quality of flour and thickness of curd. We need to prepare a batter that is not too thick or too runny. It should be of medium consistency. Keep the paniyaram or appe pan on low flame. Brush it with some oil. Take roughly 1 tbsp batter and using spoons or spatula, drop it in the hollows of pan. Place the mixture of nutella and chopped nuts in the centre. Cover it with some more batter. Let the batter get cooked on low flame on gas. Drop some oil near the edges. After roughly 1-2 minutes, check the edges of cake balls using a knife. If the edges have cooked, flip it. Pour few drops of oil more on the edges. Let it cook on low flame for 1-2 minutes or till they are completely cooked from all sides. 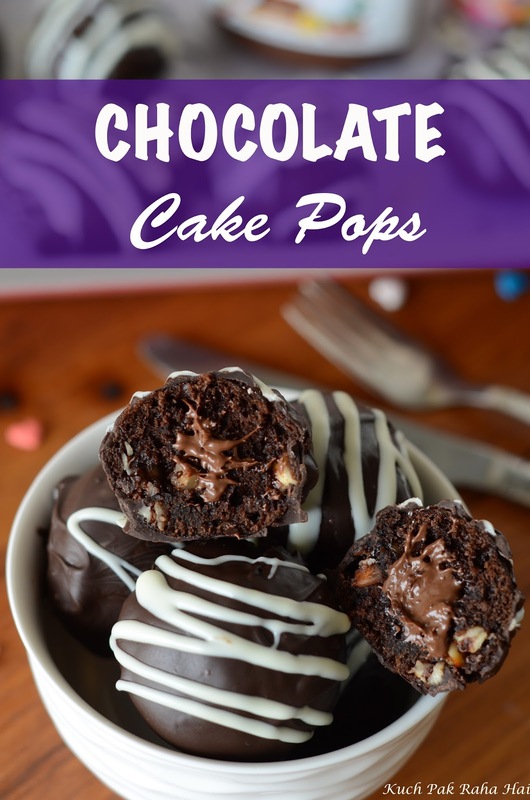 Keep these chocolate cake pops in a tray or plate to cool down. Many people raise the query on how and when to flip the appe in pan. It is very simple. Keep the knife handy when making appe. After 1 or 2 minutes of pouring the batter, check the edges using a knife. Don't let the entire appe cook completely; the flipping should be done when the centre is still wet. Use two knives if you are a beginner and be swift while turning them. Take some dark/milk chocolate in a microwave safe bowl (buy here). Keeping the microwave power to 80 percent, heat the chocolate for 30 seconds. Bring the chocolate bowl out of oven and gently mix with spoon. Heat it again on 80 percent power for 20-30 seconds. By now the chocolate should have melted completely. Dip the chocolate cake pops in melted hot chocolate. Bring them out with the help of a fork or toothpick. I am mentioning here fork or toothpick as it will help in dripping out the excess chocolate. 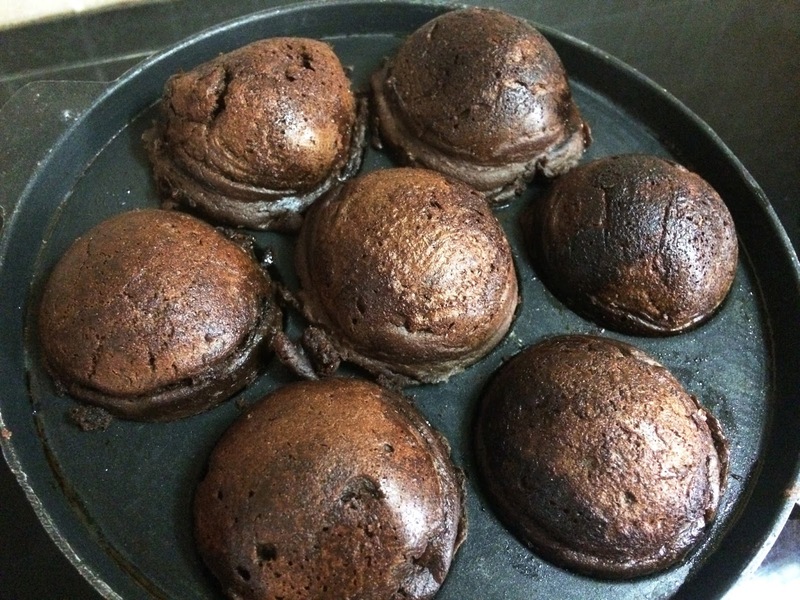 Let the chocolate cake pops cool down a bit on a sheet of baking paper. In a similar fashion, melt the white chocolate in microwave safe bowl. You can fill this melted white chocolate in any piping bag and drizzle over the chocolate cake pops or use a spoon for the same. Place it in fridge for at least 10 minutes so that outer coating is cooled down completely. Store them in an airtight container in fridge. 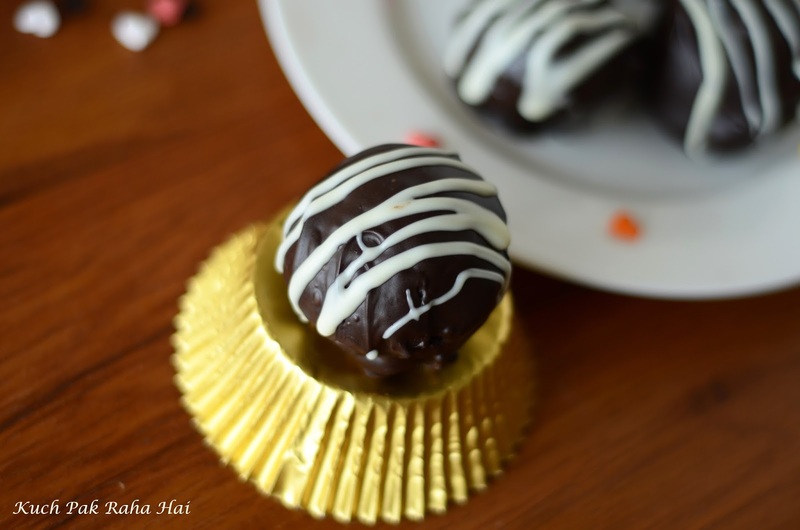 Enjoy these delicious sinfully chocolatey Cake Pops! !